Creativity: The Flowering Tornado, 2004. 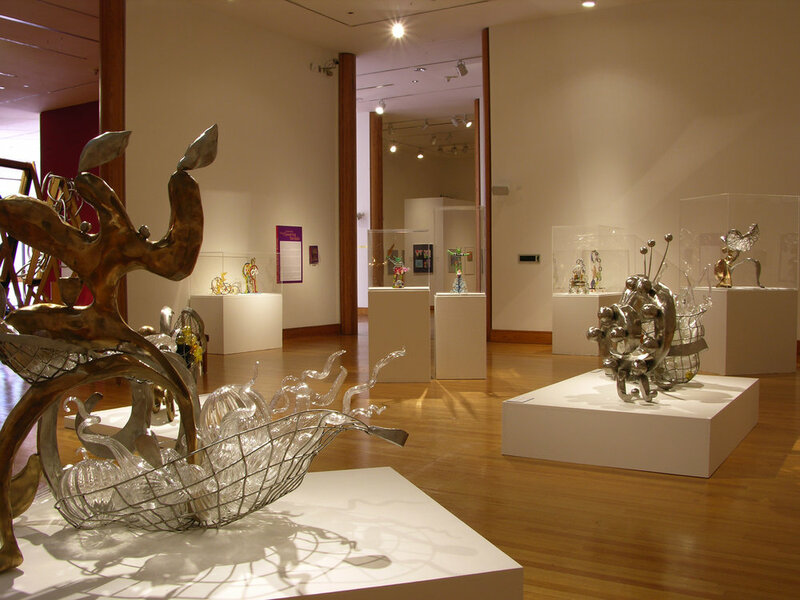 This exhibition is a beautiful installation of glass and bronze artworks created by Ginny Ruffner of Seattle, Washington. This touring exhibition has been organized by the Montgomery Museum of Fine Arts. In this installation, Ruffner features suspended picture frames that incorporate sculpted items including chains, bear traps, flowers, hearts, and arrows, with the focal point being a large tornado with wings. She graduated from the University of Georgia in 1975 and, soon after, learned how to flamework glass. In 1984, she taught the first flameworking class offered by The Pilchuck School of Glass in Seattle. Her work is in the collections of the American Craft Museum, the Corning Museum of Glass, Detroit Institute of Arts, the Metropolitan Museum of Art, and the Renwick Gallery of the National Museum of American Art.